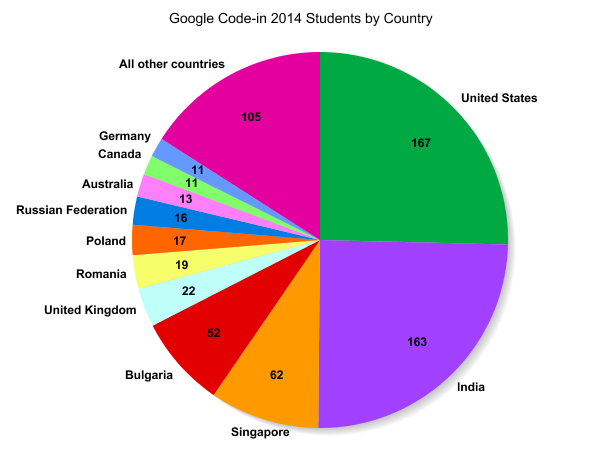 Google Code-in, our contest introducing 13-17 year olds to open source software development, wrapped up a few weeks ago with our largest contest to date: 658 students from 53 countries completed a record-breaking 3,236 tasks! We almost doubled the number of student participants in 2014 from the previous year’s contest (337). Working with 12 open source organizations, students wrote code, created and edited documentation, designed UI elements and logos, conducted research, developed screencasts and videos teaching others about the software, helped find and fix hundreds of bugs and many other interesting tasks. In the chart below we display the countries with the most student participants. This year we had nine countries with students participating for the first time: Azerbaidjan, Brunei, Chile, Jamaica, Kazakhstan, Nigeria, Oman, Saudi Arabia, and Taiwan. Students from 397 schools competed in this year’s contest. Dunman High School in Singapore for the second year in a row had the largest number of students completing tasks in the contest with 58, up from 20 last year! Govindram Seksaria Science P.U. College, Belgaum (GSS) in India had 49 students. Technical School Electronic Systems (associated with Technical University- Sofia) in Bulgaria was in the top five for the fifth straight year with 48 students. Sacred Heart Convent Sr. Secondary School, Jagadhri in India is in the top five again this year with 34 students. National College "Aurel Vlaicu" Orastie in Romania had 10 students. The graph below shows the age breakdown of this year’s students. 203 dedicated mentors from 40 countries (including six countries with mentors for the first time: Belize, Burma, Cameroon, Kazakhstan, Singapore and Uganda) helped guide students through the contest. In true “pay it forward” style, 10 of this year’s mentors were former Google Code-in students. Great job! The three organizations with the most tasks completed by students were FOSSASIA (587), Haiku (435), and BRL-CAD (383). Every part of Google Code-in was bigger this year than ever before, but the most important part of the contest is that more students were introduced to open source software as teenagers. Congratulations students on all of your hard work! Thank you mentors and organization administrators for inspiring these young adults to contribute to open source software and welcoming them into your communities.